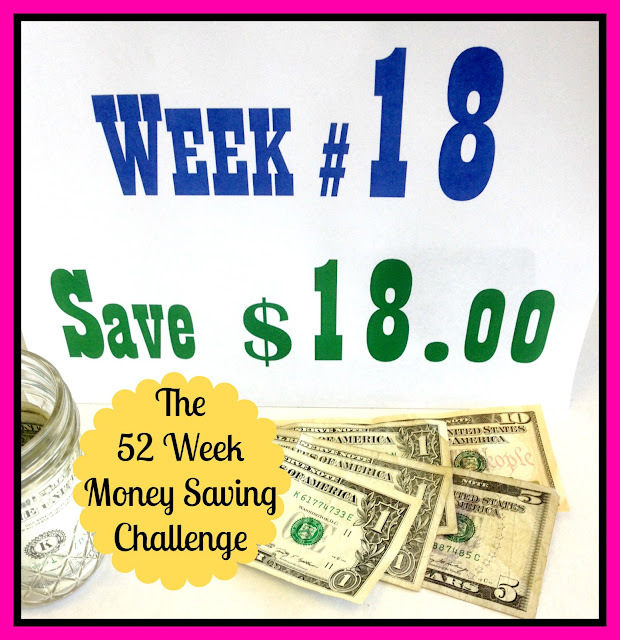 Welcome to Week #18 of The 52 Week Money Saving Challenge. This week we save eighteen dollars. Our total savings to date is one hundred seventy-one dollars. Part of the fun of this challenge is dreaming about what to do with the savings when the challenge is completed. What are you dreaming of? My thoughts on the subject vary. Sometimes I dream of from taking a little vacation. Other times I ponder re-starting the challenge next year or even doubling it. By doubling it, I mean that the challenge would begin with two dollars saved the first week, four the second week, etc. At the end of the challenge the total saved would be two thousand seven hundred and fifty-six dollars saved. Maybe that is a bit too much. What do you think? Pushing yourself to save even a small amount is the smartest move you can make. For weekly challenge updates, subscribe to this blog via blogger, google, or email. If you prefer, follow me on Pinterest or Facebook. Check out the icon buttons in the right-hand column of this page. If you're new to the challenge, welcome aboard. You can start with one hundred and seventy-one dollars to catch up with us or add a bit extra each week until you're caught up. You could also begin this week as Week #1. Whatever works best for you is fine. 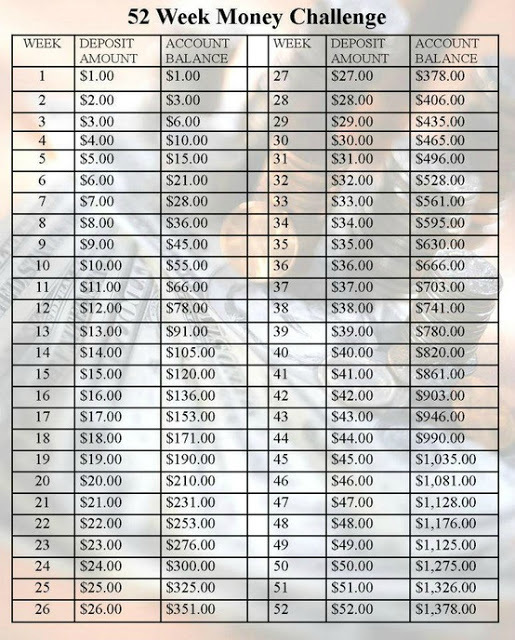 For a free printable chart, check out Stuck At Home Mom's 52 Week Money Challenge. Happy saving! I found your blog on the Aloha Friday blog hop and just started following on google friend connect. This challenge sounds really cool! I would definitely go for a vacation with the savings!